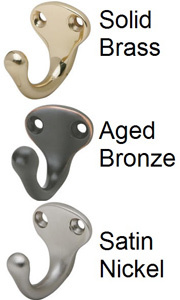 7 Std Sizes 16" to 53"
Available in three different hook finishes, aged bronze, satin nickel, and solid brass. The single style hooks are 1 1/4" wide and extend 1 3/4". Hooks are spaced 5.33 inches on center. These are high quality heavy solid hooks they are manufactured by the Ives Corporation. The wood rails are made 100% in the USA. A traditional through hole with a matching button plug to cover the screw. Mounting screws and button plugs included. or send us an e-mail with your request. mornings but not so large that things get lost. well organized and handy on a high-quality piece of stylish furniture. The 16" has two mounting holes 7" right and left of center. The 21" 26" and 31" each have two mounting holes, 8" either side of the center. The 37" and the 42" includes three holes, a center hole and a mounting hole 16” on both sides of the center. The 53" includes Four holes, two holes, 8" and 24" to the right of the center, two holes, 8" and 24" to the left of center. Oh my gosh! It just arrived - ABSOLUTELY FABULOUS! LOVE IT! Exactly what I wanted. Thanks again for such outstanding service. This is exactly what we were looking for, I'm so glad I stumbled across the website. The item came exactly as promised, and it was delivered very fast. Added bonus that it was made in our home state of MI!!! I am so pleased with this beautiful shelf with hooks. It fits perfectly where we needed it in our bathroom and with 2 young boys, my 17 yo daughter husband and I all sharing a bathroom this was the perfect solution to our towel conundrum. Thank you so much- quality craftsmanship and beautiful finishing touches. Cheers! I ordered a special width white shelf, got it very quickly and it's perfect. I looked on line at many, many sites before I found this one, and they were by far the best. They had exactly what I needed, were willing to make a special size, at a reasonable price, and made in the USA. I would highly recommend Peg and Rail! This is a very attractive coat rack. Has a sturdy construction, very well built, and it was very easy to install. The best part is that it was made with pride in the USA. Q: Is the shelf strong enough to hold 4 winter jackets? A: Yes, these are very strong. Q: Are the single wide hooks strong enough to hold a bath towel? A: Yes they are plenty strong enough to hold a towel. Q: As a church we are looking to replace our coat racks, which currently use hangers, to a coat rack with hooks. Can the shelf be made deeper than the standard 4 inches for Bibles, hats, etc.? A follow up question would be: Could the length of the shelf be customized to fit the wall space available? Would it be possible for each hook to have two prongs? Yes we can make the shelf deeper we can also customize the length to fit your needs. There are package size limitations for shipping however.. We have three different hook styles the single style shown here and a double style and a hat and coat hook, both the double and hat and coat style have two prongs. You may give me a call or email me with the dimensions you are looking for and I would be happy to give you a quote. Q: Is it possible to get a 53X4 inch shelf in white with 5 satin nickel hooks instead of 10? Yes we would be happy to make a 53" with 5 hooks. I will send an email with pricing ect. Q: Hello I am interested in one of your white shelf coat racks with a single style hooks, however I would like to have more books on actually I would like to position them in two rows that are staggered similar to your double row Shaker peg racks. This is for a special project that I'm working on, is this possible? thank you. 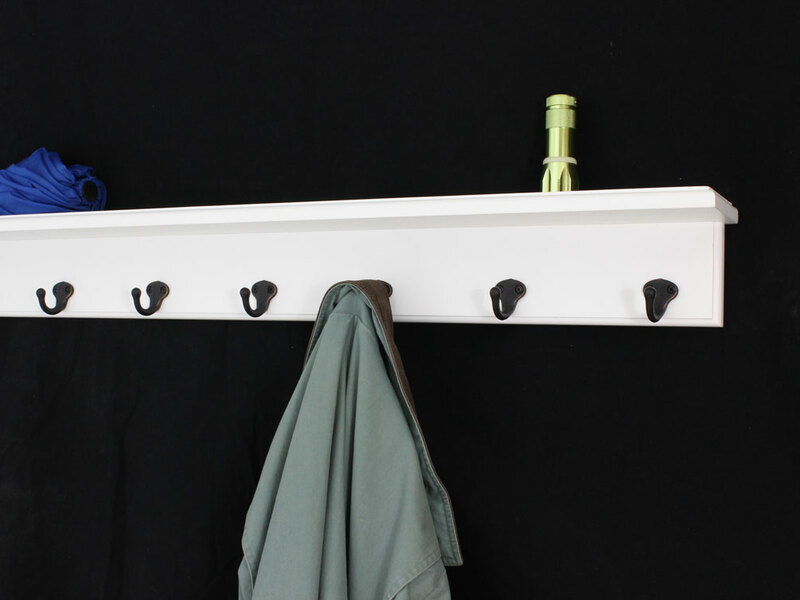 We would be happy to manufacturer you a white shelf coat rack with a double row of hooks. We may want to make the back rail taller than our standard 3 1/2 inches. My concern is that if the top row of hooks is too close to the bottom of the shelf it may be hard to get items on and off the hooks. 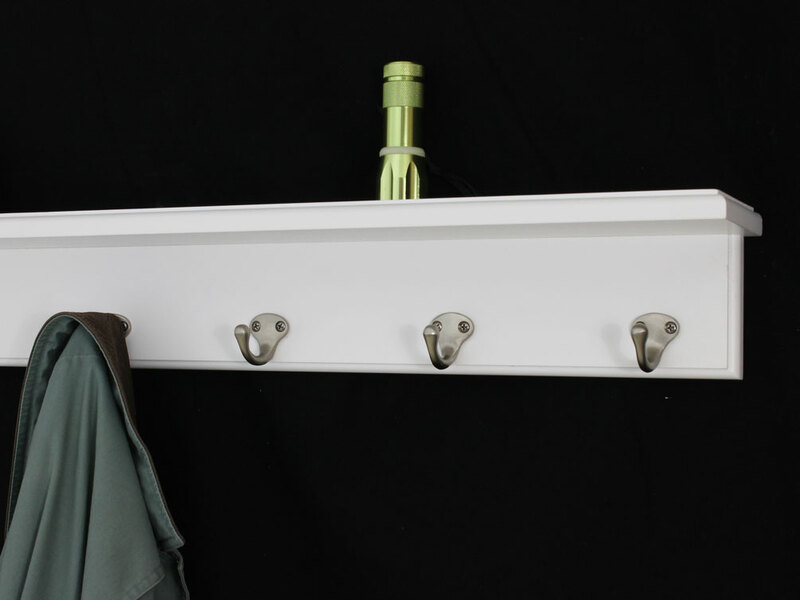 White Shelf Coat Rack - 4" Top Shelf with Aged Bronze - Satin Nickel or Solid Brass "Single Style Hooks"
"The discerning eye always knows where to look in a home," your mother used to tell you all the time. 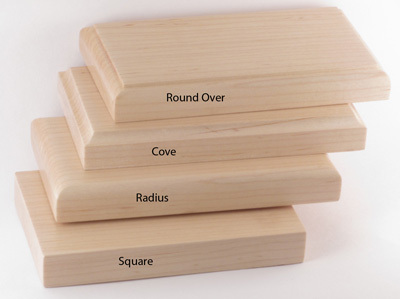 That’s why she taught you to pick out just the right pieces for each of your rooms. 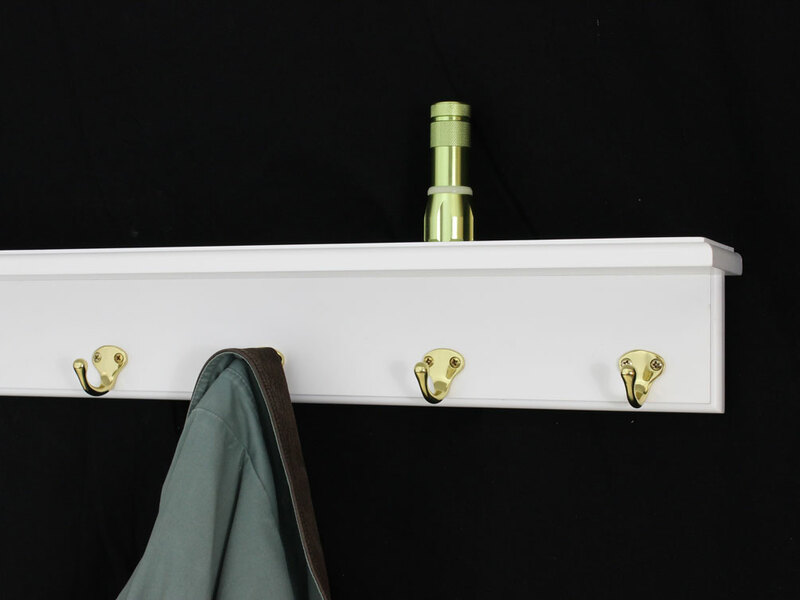 Everything has the right place in your home, even your coats and scarves, thanks to this fashionable white shelf coat rack, conveniently located right by the front door. This lovely accent piece serves so many purposes in your home, including holding the flashlight (conveniently located on the four inch shelf). You have plenty of room for your jackets, hats, scarves, and even the dog’s leash. The discerning eye will defiantly notice this piece in your home; you know just how to organize every single room of your home.